Happy Halloween to my ghoulish guests!!! For this grand day itself, I've made Barmbrack or somehow more commonly misspelled as Barnbrack. This Irish, tea infused mixed fruit bread (usually yeasted but not in the recipe I'm about to give you!) are usually served toasted and spread with a good layer of butter. They are served during tea time and with tea of course, though coffee would do too! Barmbrack taste very much like Christmas Pudding or Christmas Fruitcake to me. I first tasted Barmbrack, 3 years ago in a friend's place. She invited me over for a Halloween party and they had Barmbrack on the table. The cool thing and fun part about eating Brambrack is that it contains various objects baked along the bread and it was pretty fun digging into your slice of thick sliced Barmbrack and see what you'll find in it. In the barnbrack were: a pea, a stick, a piece of cloth, a small coin (originally a silver sixpence) and a ring. 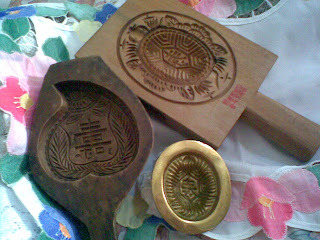 Each item, when received in the slice, was supposed to carry a meaning to the person concerned: the pea, the person would not marry that year; the stick, "to beat one's wife with", would have an unhappy marriage or continually be in disputes; the cloth or rag, would have bad luck or be poor; the coin, would enjoy good fortune or be rich; and the ring, would be wed within the year. I have not seen any commercialized Barmbrack as of now in Australia since Halloween is not a big thing here either but is definitely gaining more attention now compared to years back. My Irish friend, they have this sorta Brambrack thing during Christmas too! In the Christmas Pudding, they added in lots of old pennies and coins. No stick because it once jolted grandpa's tooth away! But things like pea and just lots and lots of pennies, I don't know why really. But I had fun digging through both her family's Brambrack and Christmas Pudding! Combine the above together with the soaked mixed fruit mixture. Pour it into a grased loaf tin. I use those disposable loaf tin and grease them generously with butter. Bake it in a preheated oven for 160°C for about 45 mins or until it is cooked and golden brown. Remove and leave to cool before serving it in thick slices, toasted and spreaded with butter. For me, I serve it plain usually on the first day but when it turned stale, I'll then toast it and slap butter over it. Your choice, either way, they're delicious! I hope you will like this recipe and enjoy it as much as I did. Happy Halloween and spook and creep yourself out by watching Paranormal Activities along with lots of Halloween food! Plain old pumpkin muffins. No glazing, no dusting, no filling. Just plain pumpkin muffins but with lots of spices to spice things up a little. Ginger powder, grounded cloves, cinnamon and the muscovado sugar. It all adds up to a very Christmassy Halloween feeling! I might glaze this tomorrow and dress them up a little if I can find the time but for now, we are eating these muffins just like that! These are tang yuan but it's not plain old pink and red balls. It's cocoa and pumpkin flavoured balls with peanut filling too. In fact, I made these when I made the Halloween Pumpkin Angku and I thought of Ondeh-ondeh. You can click here and here for inspiration. Really, there are endless ways to make these. For the skin, you can make them with sweet potatoes or just plain old beetroot juice or any juice instead of water. 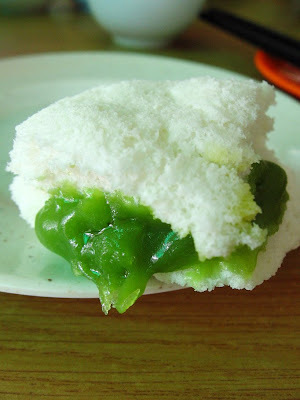 But in Asian kitchen, we generally use pandan juice to flavour desserts.For filling, try palm sugar or what we Malaysians known as Gula Melaka or palm sugar mixed with dessicated coconut too, the one we use to make kuih ketayap. These are boiled in water and usuallly poured with sugar syrup over them. But for these, I would steam them the next time instead of boiling. It's cocoa powder and when I boil them, they sorta dissolve away a little, jeez.....Anyway, had fun making them and I like the idea of replacing water with milk and normal sweet potato puree with pumpkin puree. The chocolate coloured one has pumpkin puree in it too. Now, indulge! Late night treats, I'm putting on so much unnecessary calories to my things but I really don't care because it's worth it! I use this sweet potato ondeh-ondeh recipe. Maybe I should have coat these balls with dessicated cooconut. They look like frizzy balls. Now, indulge! Late night treats, I'm putting on so much unnecessary calories to my things but I really don't care because it's worth it! And for Halloween, I elevated and refined these a step further and make it look like little petite palm size pumpkin. 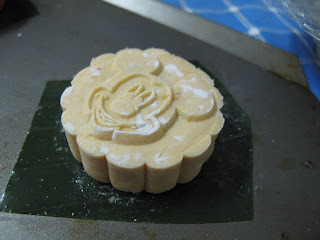 I made peanut filling and the skin is made from a mixture of glutinous rice flour and pumpkin puree. And for the equipments needed, one toothpick and a few cloves are all you need really! From Red turtle to Orange Pumpkin, how's that for a Fairy Godmother working charms on Halloween? Make these and you can choose to fill them with black sesame, green bean or red bean filling too if you like! Picture courtesy of Rose's Kitchen and Ellena of Cuisine Paradise. It's a day closer to Halloween. I don't celebrate it much in Malaysia generally but to make Malaysian desserts and have them resemble Halloween are what I like to do! My love for Mahalepi is insatiable! I really don't know why but this Cypriot dessert really captures my heart. It reminds me of Malaysia and Tau Fu Fah (SoyBean Curd) all the time. Malaysian syrup drink, namely called Sirap or Bandung (when you add evaporated milk to it) tasted exactly like Mahalepi. It's the rosewater. The rosewater is the key why Mahalepi reminds me of Malaysia. Simple add cherry or rose petal to tint the rosewater syrup redish like when you melt sugar with boiling water over stove. Click here for recipe!!! This post is all about picturesque looking Mahalepi. I hope my photos manage to make you die for one and whip it up in the kitchen. No baking, simple stove top stuffs done under a few minutes. Good night Adelaide! In conjunction with Halloween, I have made these creepy fingers. I have adapted the recipe from Coffee and Vanilla and modified it to suit my taste and I only made a dozen fingers with this. I like flaky and crumbly shortbread, the texture of pies and tarts pastry if you know what I mean. I have changed the method slightly and incorporated a pastry rubbing technique called Frissage. It's a French term which basically means smearing the butter into the flour so you get alternating sheets of them. Preheat the oven to 175°C. Place all the ingredients above in a food processor and pulse it several times until you get a uniform crumbles. Pour all out onto a clean work table and use the Frissage Rubbing Technique (I've heard a lot about this in words but never seen a video so well made!) to work the dough. The frissage method really produces a flaky shortbread that I like better in terms of texture. You just need to do it once and that will suffice since it's a small batch of dough. Cling wrap it and chill it in the fridge for 30mins or so. After 30mins, gently roll the dough into 12 balls. Just eyeball it, the more uneven you are, the more different sizes of fingers you get. Roll it to form a finger shape, give it a few crest and lines with the toothpick to mimic a real finger. Finally press the peanut halves on the end of each finger as nails. We finished our fingers in less than an hour. I like how muscovado sugar flavours the fingers. There's just no substitute for it, muscovado itself has a very unrefined, pure and Chrismassy feeling for me. Now, get your oven preheated and whip up these spooky and creepy fingers to impress your friends! It's Halloween this Saturday. In Malaysia, we don't do much celebration but I was supposed to have a Halloween themed birthday bash this year but it's called off because I'll be having a take-home exam this Friday and it's a freaking 4 days 3 nights take-home exam! I guess Halloween could be just a simple celebration with some gross-looking things and enjoy a horror movie or two on the couch. Made this frog egg drink. I know it's not quite like frog egg nor frog spawn but this is the best I could make with stuffs readily available in my pantry. If only I could find basil seeds or biji selasih as that's what it's known as in Malay. Basil seed totally looked like frog spawn when cooked! In Malaysia, basil seed could be commonly found in ABC or Ice Kacang and Rosewater syrup drink. I think I could find basil seeds in Adelaide, I haven't try though. There you have it. Your supposedly gruesome but delicious Halloween drink of frog egg and creepy juice to serve up to your ghoulish guest. Have fun! I made this with Sammi yesterday. I won't say I taught her, more like we learnt from each other. Thanks Sam, it was a good experience having you in the kitchen. Just remember not to measure 6g of salt with my not-so-sensitive digital scale, just use 1 tsp of salt for every 6g! It was the first for Sammi and the n-th for me in terms of kneading and making Asian buns from scratch. We both agreed on going with bread recipe using water roux starter (i.e, the famous 65°C Tang Zhong) and opted for a savory filling rather than the usual sweet filling. I have been dying to try the curry chicken bun recipe from one of my cookbook by Agnes Chang called I Can Bake and as usual, Agnes never fail me. She never did. Even if I failed, it's my fault, not Agnes's. The chicken filling could have been more spicy, I blame my not-so-Asian curry powder and the fact that I use frozen curry leaves, I don't blame it on Agnes.It could have been more onion-y, if you know what I mean but I blame it on the fact that I use brown onions which are sweet rather than shallots. I really like using shallots but they are just so expensive in Adelaide, fetching up to AUD$13.00 per kg. So, it's not Agnes fault at all! I have used Yvonne C famous book, 65°C 汤种面包 by Yvonne C water roux bread recipe. The marriage of Yvonne C's bread and Agnes's curry chicken filling was very nice. I like how the bread turned out to be. In terms of texture, they are soft and fluffy. I like how the pandan strips across each bun glams up things! Just remember to loosely wrap the pandan strip around the buns. I already loosely wrap it around the bread however, upon doubling and baking, the strip still sort of choked the bread. Next time, will have to even loosen the pandan strips! Tang Zhong is basically one part of bread flour or high-protein flour to 5 parts of room temperature water, measured by weight. It is cooked until it reaches the magic number 65°C and cooled before added into any bread recipes. Any normal bread recipe could have Tang Zhong incorporated provided you keep the ratio of Tang Zhong to be approximately 20%-30% of the flour content provided in the recipe and adjust the water content. 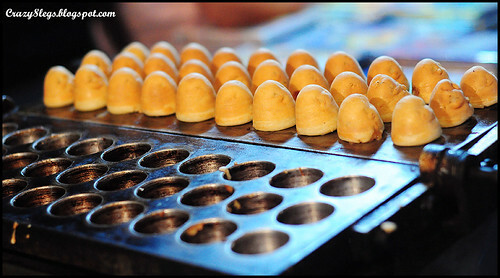 Breads with Tang Zhong incorporated in it are softer and remain softer for a longer period without any bread softener added to it. It is the gelatinization of starch in bread flour that causes this when the mixture of bread flour and water is heated until it reaches 65°C. Starch gelatinization helps absorb more water to provide the soft and elastic texture bread. So, baking is really about science and not an art as many people thought it is! 500g water + 100g bread flour is what's given in Yvonne C's book and could be easily reduced since this makes a large batch and you will only be using a little of it to incorporate it into the bread dough. As long as you keep teh ratip by weight to be 1:5, it will be alright. I've tried using pasta water to increase the starch content. It doesn't harm it but it doesn't seem to me like it improved it too so just stick to plain water! In a small pot, whisk the bread flour with water until well combined. Turn on the stove heat and set it to medium low heat. Cook, stirring often until the mixture turn white, starchy and when you use your whisk to make a stroke, it leaves an obvious trail in the mixture. Tang Zhong is done when you see those signs, though a thermometer would be great and precise to tell you it's 65°C. Remove Tang Zhong to a small bowl and cover it with cling wrap touching the surface to prevent skin formation. This could be kept up to 3days in the fridge and discard and do not use when it turn greyish. Once it forms a smooth mixture, add in 45g softened unsalted butter (remove 1 tsp salt if using salted butter, that's what I would do next time. Bread came out a little salty just now but still tasty) and knead till a smooth glossy, satiny ball of dough is formed. Add bread flour only if necessary and very sticky. All the kneading with hand will probably take up approximately 20-30mins, that's how long Sam kneaded just now! Smooth out dough and place ball of dough, seams side down in a lightly greased bowl. Cling wrap it and let it rise until double in size and pass the finger test, that is, when you poke the mixture, it doesn't shrink back and the hole remains visible. Ours was a little too wet, probably could do with more flour Sam but it's okay, still yummy! Punch out all air bubbles from dough with your fist and knead it briefly. Weigh each portion to approximately 50g or so. I managed to get 11 balls. Wrap up with the curry chicken filling and seal the seams well to prevent leakage. 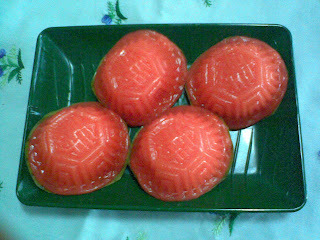 Very loosely wrap a strip of pandan leaf across the centre of the oblong shaped bun. Place it on a greased tray. Repeat with the rest until finished. Now, let it rise again until double in size. When doubled, bake it in a preheated oven at 200°C for 15mins. Stir fry A with the 2 tbsp oil until fragrant. Add in B and stir fry until dry. Do a taste test and dish up. Leave it to cool and set aside. This makes enough for 18 buns of 50g each, keep the rest for other use or just half the recipe and fill the 11 buns above thriftily. I am submitting this post to the weekly Yeastspotting organized by Susan of Wild Yeast Blog. Kaya means rich in Malay. In my family, the hokkiens called it kaya too but with a more chinese accent, if you know what I mean. Kaya is defined as coconut jam in wikipedia. I don't like thinking of them as curd, rather I'll call them spread. Srikaya or serikaya are green in colour, the result of blending coconut milk with the pandan leaves. Kaya is just brown caramel spread, sometimes not even flavoured with pandan. In the end, they both still fall within the kaya family and are equallly delicious. In Malaysia, we usually slap kaya on toast. In fact, there are two slices of bread, toasted to perfection, with a side slapped with Planta margarine or butter and the other one slapped with this rich kaya. These two slices of toasts are sandwiched together and are commonly called 'Roti Kahwin' which also means 'Married Bread'. They are usually served alongside 2 free range half-boiled chicken eggs. 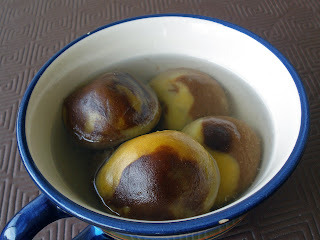 Kaya is commonly served with Pulut Tai Tai as well, the blue Peranakan kuih. Finally, kaya can also be found in the form of steamed kaya buns or just kaya balls. Remove 3 tbsp castor sugar and set aside for later use. Whisk coconut cream, remaining castor sugar and eggs until well combined and more than half the sugar has dissolved. Pour everything into a slow cooker. Drop the bunch of knotted pandan leaves in as well. Set it to high for 2 hours 30mins, stirring 4 times in between; that is equivalent to stirring once every 30mins. In the last 20mins of cooking time left, caramelize the remaining 3 tbsp of sugar reserved earlier in a non-stick pan. When it turned an amber dark colour, turn off the heat and pour the caramel into the slow cooker mixture, stirring with a silicone balloon whisk at the same time. It will bubble up a little but it will not splash. Cook it further until time is up and off the switch. When it's cooled down a little, run a hand blender through the thick mixture until it's all smooth. Pour it into a sterilized glass jar and cover tightly with the lid. Let it cool to room temperature before spreading and keeping it in the fridge. Some points to note, you need not pour all the caramelized sugar in if you do not like a too dark colour of the kaya. You can use 3/4 cup of sugar instead of a cup. Any more less sugar will not be recommended since sugar is what preserves the jam. You can make serikaya by blending the coconut milk with the leaves and you'll probably need more leaves. You can only make serikaya with fresh pandan leaves. Try using frozen pandan leaves and you'll get a greyish looking jam. I suppose by now, you could tell I'm talking from past horrible experience, don't you?Yes you can use pandan paste and all and I do have them in the pantry, but I'm in the mood for au natural today so be it! Let me share a secret with you, I lick my pink whisk clean before I wash them. Don't pretend like you don't! I want to utilize my 17cm chiffon pan and not just use it for making chiffon which I don't make very frequent. I have leftover ham and cheese waiting in the fridge for me and they're just begging to be used. It's been ages since I last made savoury buns or breads. I planned to submit this for World Bread Day 2009 but later changed my mind because I wanted something more simple, classical and yet elegant which was why I ended up submitting my White Milk Bread. This was nice but a bit on the saltish side, maybe because I have used salted butter, added the salt, use more ham and more cheese. Opppss......trying to finish up leftovers! But the texture of the bread was really good, even without any eggs. I will try using this as basic sweet bun dough recipe and cut down the sugar the next time I feel like making bread again but to make savoury bread, this is a real winner! I am officially very happy because yesterday was the last day I ever need to attend class in my entire life. I do still have lotsa datelines to meet for assigments and projects but at leadt I don't have to wake up wee early and sleep later anymore. 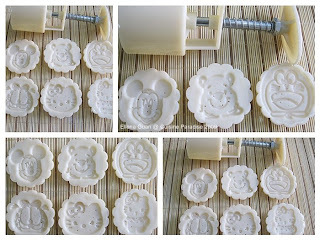 I am lagging behind my post because I am churning stuffs in the kitchen faster than I could do the write-ups. Anyway, I still would like to give way for my old post for this mini bundt cake tower. It's the same steamed chocolate cake recipe but I made them in mini bundt mould and pour over a 1:1 ratio chocolate ganache and sprinkle them with hundreds and thousands. I think they look pretty elegant. Happy anniversary honey! I just couldn't find the candle so we both do without it. I quartered the original recipe and yield 24 mini bundt cakes. Will have bread post after this but for now, gawk at these chocolatey bundt photos!